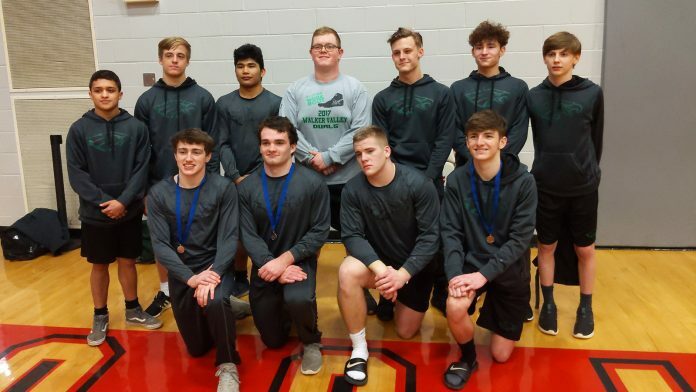 Ooltewah, TN — Rhea County Wrestling Team competed at Region Meet on Saturday and advanced four players to the State Meet to be held at Williamson County Agricultural Exposition Arena on February 14-16, 2019. Rhea County took eleven wrestlers to Region. Garrett Smith with 2nd place finish in very close match in championship, Wyatt Stumbo earned a third place finish, Jacob Scruggs earned a fourth place finish and Logan Douglas finished in fourth place. Wrestling at the meet were: Marcos Garcia(113), Jacob Judkins(120), Logan Douglas(132), Wyatt Stumbo(138), Jagger Hickman(145), Noah Varner(152), Kobie Thurman(160), Fransisco Perez(170),Jacob Scrugs(182), Garrett Smith(220) and Colton Edwards(285).